Happy Monday friends, I hope you had a wonderful weekend! Today I'm sharing a few steps I'm taking to make sure my Facebook reach is still relevant in 2018. A few weeks ago Mark Zuckerberg informed the world that there would be yet another algorithm change to our news feeds. This change will filter our feeds to see more posts from friends and less from businesses, ads, and politics. I'll be honest, it's a great idea. However, because I am getting back into small business, I was a little concerned. Over the years, Facebook has proven to be a great outlet when it comes to small businesses. We are able to reach SO many more people than we ever would with having just a website. This algorithm isn't the end of small businesses, we just need to educate our friends and fans on how to follow along! That being said, there are a few steps I believe we can take to do just that! 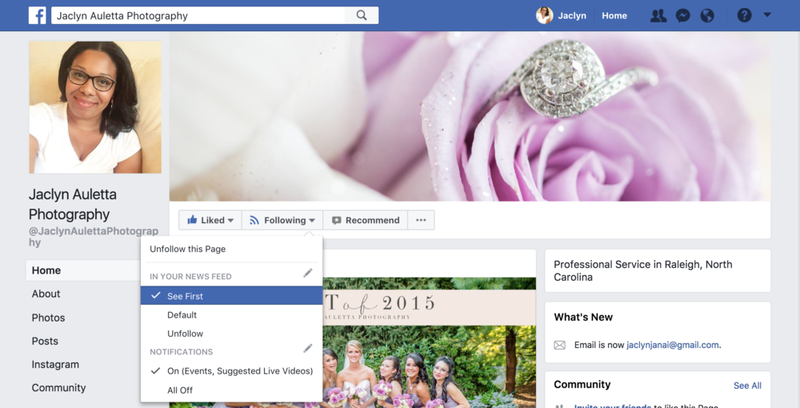 Templates - If you're new to having a business page on Facebook you'll want to explore your settings a bit before changing anything. One of the little known facts about pages is that they now offer templates! Most businesses set their pages to Standard (like mine) but depending on the type of business you own, you may want to change that. You can find this under Settings > Edit Page > Templates. Choose which template you think would be the best fit for your business. The Standard template is simple which is why I like it! Tabs - On that same page where you find your templates you will find your Tabs. This is the content you want your audience to be able to access easily. You can add as many tabs as you'd like, however if you're business doesn't hold Events, have a Shop, offer Jobs, etc. then I would recommend removing it. Only displaying tabs that are going to be most relevant to your business is best. Once curated, these tabs can be found on the left side bar underneath your photo when you first go to your page. One of the recommendations to staying relevant in 2018 is posting more videos so make sure your begin to incorporate that to your page this year and add it to your Tabs section! Custom Invitations - Just like any other invitation, you don't want send a generic blurb to your friends. It feels impersonal and tends to get lost in the sea of invites from all of their other friends. Instead, change that text to something fun making it a more genuine invitation! Facebook's algorithm is ever changing so also asking them to set their notifications to "ON" will ensure that they are seeing your posts. In addition to setting their notifications to "ON", let them know that they can also opt in to see your posts at the top of their news feeds by selecting "See First" under the Following tab at the top of the page!